Thursday July 14th 1921 Last night the hottest yet. Edith went up town in the AM. We had a shower about noon. Much cooler. We all rested in afternoon. Evening on the porch. Friday July 15th 1921 I felt wretched all day. I slept awhile in afternoon. I walked up town after supper to take a treatment of Dr Woltman. A letter from Mrs Pickens. I will visit them. Saturday July 16th 1921 I spent the day at Woolfs. Frank came for me and late in the afternoon we took a long ride out past Boynton. It was a great treat. How Will would have enjoyed it. When I got back found the folks very tired as they had extra work with company for dinner. Mr Parsons and Mrs Sheely here and callers in afternoon. Sunday July 17th 1921 A hot day again. Read some in forenoon. We all rested in afternoon. Later there were callers. Mrs [Stabler?] and family. I wrote Hattie and Mrs Pickens after late lunch. The rest of evening on the porch. 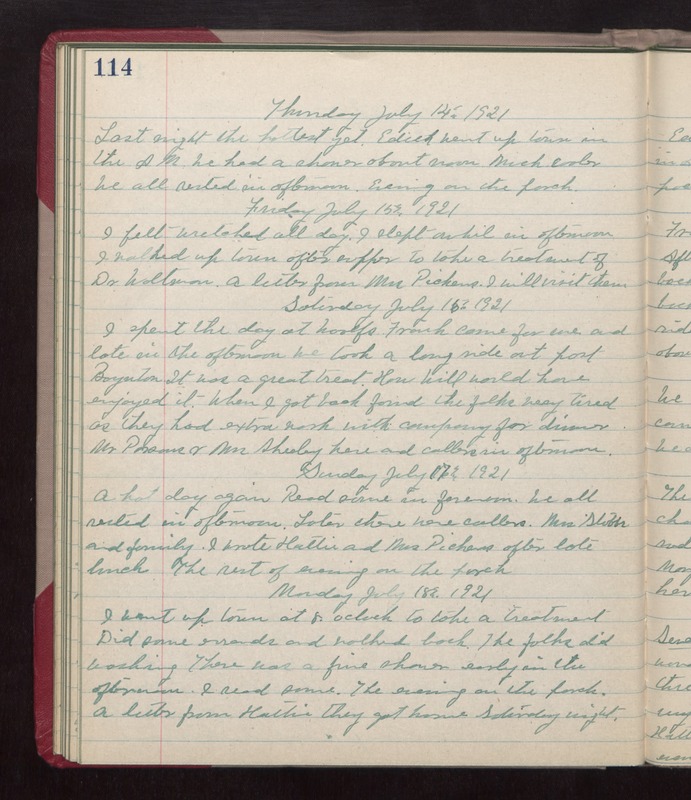 Monday July 18th 1921 I went up town at 8 oclock to take a treatment. Did some errands and walked back. The folks did washing. There was a fine shower early in the afternoon. I read some. The evening on the porch. A letter from Hattie they got home Saturday night.